I did a windows update this morning and then logged back in and ever since almost every loading screen does a sort of alt tab and then alt tabs me back into the game. Idk what is up with the game would a -repair to the launcher fix this or is this all on the windows update. I wouldn't know how to fix that. There's a new feature called, "Focus Assist" which can be adjusted to bother you less. On the internet, people have been suggesting that you turn it off... and that seems to help most people. I've instead turned it on and specified: "only bug me for priority updates" and then removed every program from the priority list. So far, I don't even get bothered by update notifications. Recommendation: try disabling it first (since that's easiest); if it doesn't, try my suggestion. Technically, it's not really a new "feature" — we just never had any control over it in previous versions of Windows. So it's better now, because you can make very detailed choices about what sort of notifications will steal "focus" from your current window. However, the default settings are too liberal for a lot of people's tastes. I don't think it's that. It's literally EVERY loading screen and I'm logging on alts and stuff so its a lot of loading screens. Yeah beware of your game potentially freezing if you alt + tab too much, at least that's what happens to my game sometimes. This does not fix the issue. You've tried both shutting off Focus Assist and (if that didn't do the trick) turning it on for priority updates only (and then specifying zero apps for priority)? Another article suggested turning off the automatic rule for gaming (whether or not Focus Assist was on for anything else). Another article suggested tweaking notifications. Settings → System → Notifications & actions. Other articles have suggested rolling back video card drives. Happens any time I switch maps. It's not resolved at all. Destroys game modes like WvW. Not saying this doesn't need a resolution, but how does showing the desktop only on loading screens affect gameplay? If it happened randomly during gameplay, I'd understand, but on loading screens...I'm not sure I follow. You must not play WvW or anything like a boss train where moving fast between maps is an imperative. instant death and a loss of the property. It's also extremely disorienting to those with brain damage and vertigo/inner ear issues. Nausea and dizziness are instant when this happens, this is impacting not only the game, but people's health. I have turned off Focus Assist and still have the trouble, as do other guildmates. Mine started with this update. I've tried switching between Windowed and Fullscreen mode and that doesn't fix it, either. I haven't rolled back video drivers. It is happening every 3 mins in game play for me. I haven't been able to play the game since this started. For the last few weeks , anytime I switch from one location in the game to another, I end up on my desktop for a few moments. There is a slight flickering of the desktop, then I get transported to the location I intended to go to. Starting getting this problem just yesterday, after a windows 10 update. Same thing also happens on GW1! Changed settings to Windows Fullscreen on both games, and everything is back to normal. I am sorry to hear that; sounds like a different issue than those posting about the loading screen snafu. Adding my voice to the others for the loading screen issue. Updated to latest windows on my gaming lappy and it now jumps back to desktop on loading screens for a few seconds and back into the game. It has no impact to how I play the game as I'm just doing PVE and it's only on loading between zones or whatever, and always comes back before loaded into the new area - it's a little annoying, but not a huge problem to me so not sure I want to go through the hassle of raising a ticket that will go ignored for the better part of two weeks to try solving a problem that doesn't really bother me that much! Playing in windowed mode stops the problem but THIS IS NOT A PERMANENT FIX FOR ME IMHO. I wanna play full screen. My issue started out with the loading screen and map change like everyone else. Then it also started to do the same exact thing as map change but while I'm playing. It is not a different issue. It's not just related to that focus assist thing or windows update 1803 - i'm on windows 10 update 1709 and my game tabs out to desktop anytime i get a loading screen/change maps, and i have to alt-tab back in. I haven't played in a couple years and only reinstalled the game over the weekend - have been having this issue since i installed. edit: it's also not limited to Steam or Nvidia as some people suggested, as I don't use Steam and I have an AMD card. This is the only game where I'm having this issue. For me, when I minimise/maximise the game too much, my frame rate eventually drops from it's usual performance suddenly to 3FPS. Closing/re-opening the game fixes this, it's how the game interacts with my system, I think it crashes a gfx driver. It's why I now follow guides on my smartphone rather than my desktop. So I'd prefer to not have my game flash my desktop, purely for this reason. This. It may seem like it's the Windows update but it's not. It's something that got changed in the game client recently. Perhaps whatever they did to reduce the new zone's loading times. The game is dropping out of DirectX's full screen exclusive mode during asset loads. Also happening to me only since the Win 10 big April update. Microsoft's motto must be, "We're not happy 'til you're not happy!" Is anyone else experiencing this issue? I've not heard of it at all, nor are we seeing it on social media. Yes, immediately and consistently since the Windows update this weekend. Now it happens on every loading screen, as it does for some other guildmates. None of the workarounds above eliminate the problem, though turning off Focus Assist makes it persist for about 3 seconds instead of 10. 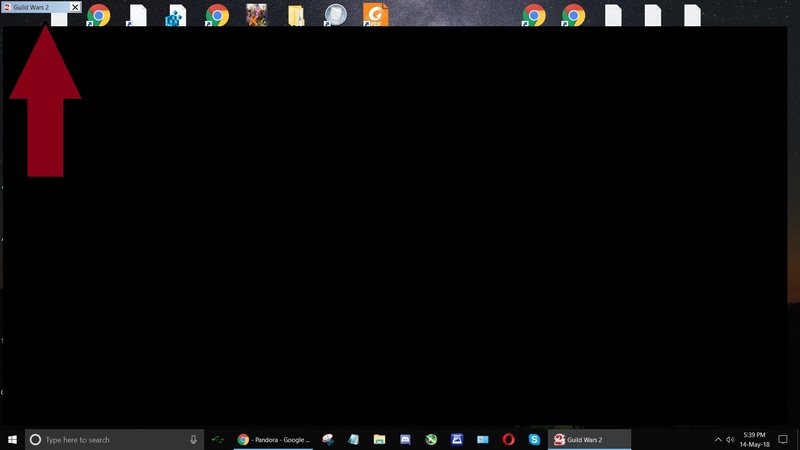 Not only do I have all the issues with alt-tabbing on load screens and have tried every solution, I have always used hidden windows taskbar and it now shows up when I am in game should I hover where I have it set to be. (For example hovering over the mastery bar in game and having a windows bar not only pop up but cover that part of GW2 in fullscreen making it unable to be clicked.) Windows update broke GW2 like this for everyone I know! Hello all. I just wanted to add myself to the list for desktop flashing on zone transition. Two computers on two separate accounts are affected. One in-game bug report sent from one computer. My issue started after the April 2018 Windows update. Pretty positive that it is the cause since both computers started having this issue despite different installation dates for the April 2018 Windows update. I have tried the aforementioned suggestions (turning focus assist off and running as administrator), but with no luck. Graphics driver is current. Both computers have different specs, so it is unlikely that it is a hardware/driver issue. loading dungeon and fractals instances result in "desktop flashing"
Just play Windowed Fullscreen until MS fix the issue. Rolling back to 1709 (win10 fall creators update) or below, seems to work out fine for me. Omg! I googled how to do that and it worked. Thanks! Still occurring. Windowed full screen is too much unneeded stress. Will wait until there is a fix for fullscreen mode. Told to put in a ticket, so I did, and they keep replying by asking me the same stuff I already provided in the original ticket. Completely ignoring ever word I wrote, and completely ignoring the file I already gave them. I am so angry with them right now. If they don't know what's up then just say so. Playing someone for a fool by repeatedly asking for the same info already provided is beyond disrespectful. Yeah I don't see this being fixed any time soon. Feels like I'm dealing with EA right now. On page 3 onwards, this thread has been wrongfully merged with a Deadeye feedback thread, as well as being merged with an older thread not related to the newest issue of game interaction with Win10. This entire merge is a mess and not very helpful. I've done that. I hope the CS Team can make enough sense of this tangled thread to see that there's a compatibility issue with their loading screens and the recent Windows update. Time to add my voice here. I'm having the same thing. In addition to the flash to desktop on map changes, it also does it when I change my graphics preset setting. I've tried all the suggested fixes with no success. Just adding my voice to this thread in the hopes that it will contribute to a fix of this issue (or at least leads to some attention regarding this issue). I'm experiencing the random tabbing out since today - this issue started the second the most recent Windows 10 update (version 1803) was applied to my system. Actually, the "tabbing out" in my case is more like the GW2 window getting transparent/invisible, while the GW2 specific mouse cursor is still visible, as well as the title bar of the GW2 window (visible in the upper left corner of my screen). This mostly happens during client startup (when it switches from launcher to character select) and during map loading screens. As I mentioned in the other thread, before they merged it. You can try and roll back to an earlier Win10 build by using this: http://www.thewindowsclub.com/go-back-to-an-earlier-build-of-windows-10 or by finding a legit .iso with an earlier build, if it's due to the April 2018 update, which is in my case true. After that to avoid updating to the April 2018 update, you have to defer important updates in Settings> Updates & Security panel > Advanced Options. But if your windows has updated recently, it will only keep the old files for 7 days or more, until it gets deleted. Had it before the Win10 update. Since a week or so when swapping maps, alt tab out and back in the game switches to a desktop screen with gw2 in the upper left corner minimized for 3-4 seconds, after that it returns to normal. It happens on logging to another alt ( in the same map ). Windowed Fullscreen doesn't have this issue. Does't look like a secondary program or graphical card issue, just some setting that minimizes the loading screen for a while. I've been experiencing this issue after the Windows 10 update.It happens during map loading and when I alt -tab, also happens when I change the graphics presets in the in-game display settings. As I mentioned in the other thread, before they merged it. You can try and roll back to an earlier Win10 build by using this: http://www.thewindowsclub.com/go-back-to-an-earlier-build-of-windows-10 or by finding a legit .iso with an earlier build. Thank you for providing this link. For people who prioritize a bandaid fix for some flickering in a video game over an up-to-date operating system this might be a solution. To those who use their PCs for other things as well (which might require an up-to-date OS), this is not exactly a viable one, sadly... Even though one might argue that the newest OS version isn't always the best -> there are other strange things happening since this update (like an OEM partition suddenly showing up with a drive letter assigned to it, while Windowns happily complains about "not enough space" being left on it). Maybe we are lucky and there will be another update soon addressing some of the issues. But my hopes for this very specific issue with GW2 magically disappearing with the next update are very low. Wait, you are "keeping it in mind" for "future" "adjustments"? This is crippling the mechanics, it should be top priority to be fixed immediately. If you don't test these terrible Deadeye changes (on all levels), you already saved time. Now you can invest these for at least a tiny bit of quality management. Please someone, stop the map flashing to my desktop at every single map change! Glad to see that I am not the only one that is experiencing this. The same thing is also happening with Guild Wars 1. Hopefully it will be resolved soon. You are quoting someone that is responding to the Deadeye changes thread that was merged with this one, if you are not aware. A merge snafu. Same issue here. Running the game as administrator and turning off the new Windows-Fokus-assistant was able to reduce the duration the "alt-tabbing" (similar to duration in the video above). For me this started after the new Windows 10 update. I have a 1070 graphics-card and just installed the newest drivers. Right now im reinstalling gw2, but after a first try the "alt-tabbing" is still there. As soon as the game is installed completely i will write an ingame ticket. Can you submit your ticket through the support site instead of through an in-game ticket? While the team will see and review reports that come in through the in-game system, we support agents can't reply to them and open a dialogue with you to easily request additional logs or to recommend other troubleshooting steps to you. This is happening to me too after windows 10 update this morning. Happens in GW1 and GW2. Submitted a ticket through the support site. Yeah same thing with mine. Since this started happening I took get the game in the upper left like that. I've done that for over a week now, and they keep asking me for the same info that's in my original ticket. They are either not reading them, or trying really hard to dis us while buying some time. I knew what they would be asking for so I gave them everything. Now their solution is to just run in windowed mode which is not an option for me because windowed has microstutter, and gsync although can set it to windowed and fullscreen runs like garbage in that mode. And add me to the list too. Did the latest Windows update yesterday, and after that both GW1 and 2 do the same thing when loading, as described above, and show the windows desktop. Thought it might be a discrepancy between the latest Win10 update and Nvidia drivers, so I updated those too, didn't solve the problem. So it's not the latest Nvidia drivers. Never had this happen before. It's definitely Windows 10 latest update related.